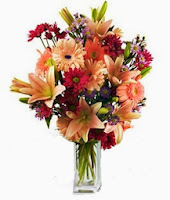 Flowers for someone who is sick or injured can provide such a lift for the spirits. If you know someone battling to get better, it's such a nice gesture to send some "recovery flowers" to let that person know that you're thinking of them and wish them the best -- particularly if you're out of town and can't make it to see them in person. Bloomex provides some ideal bouquets on our 'Get Well Soon' page, which we encourage you to have a look at. A lovely arrangement of Alstroemeria, Mini Carns, Chrysanthemums, Waxflower, Carnations and a stem of Salal (pictured above). This bouquet is somewhat of a new arrival and it is proving quite popular with our customers. 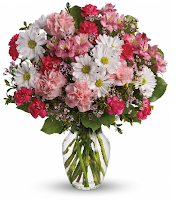 This assortment of beautiful flowers is sure to brighten that special someone's day. Yours for $39.95. 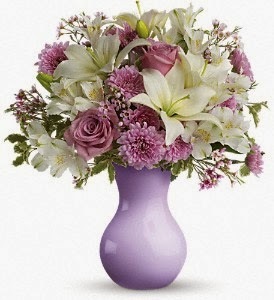 The pastel-like colours on this are wonderful for a recovering person, featuring shades of lavender, purple and white, consisting of Alstroemeria, Waxflower, Roses and Chrysanthemums. Only $44.99. If you want to go all out, this bouquet lives up to its name, with a generous assortment of Daisies, Aster, chic Gerberas and Lilies adorned with a variety of fresh greens. It's an unforgettable bouquet for the very special person in your life. $87.99.